Anyway, this was the first time I have run the Spansh Fork Half, and it was a very beautiful course. We ran through the riverbottems, into Salem, then looped around back to the river bottems. The first 11 miles felt fantastic, even with hills lasting miles 6 through mile 8. The last two miles were a bit harder. Usually when I'm running, I think I could definately run one more mile. This time I was thinking I definately hope I can run one more mile! But I finished with a time of 2:12:39, which beats last years time by 31 minutes, so I'm thrilled! 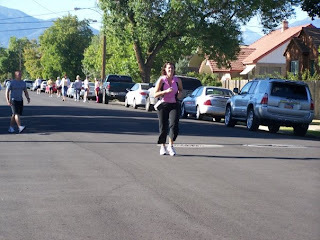 This picture is right before I cross the finish line, and it doesn't even look like I am running, but I swear I am! Utah Valley Marathon, here I come!!?? That would be a lot of fun we should get together. We will be coming down next weekend so maybe we could do something Friday. Saturday we will be going to the game. Let me know what you want to do. I agree!! We totally need to get together sometime!! We will have to set something up! !Congratulation on your half marathon!! Your Awesome!!! How did you start training for your marathons? Did you just start running or what? Thanks for sharing! !I am totally going to check into it!! Congrats on your time in the Spanish Fork half. Mandy you are awesome! Good luck on the full! So I have another question for you! How long did you train before you started running marathons? I looked at that web site you told me about! You have totally movtivated me! If you have any advise I would love to hear it!!! Thanks!! Way to go Mandy! I wish I was that diciplined with exercise. I'm sure I would feel alot better if I did it consistently. Good luck with your next one! You are so awesome for doing the half marathon. You will do awesome on the full, I can just tell. You definitely have the motivation there! Best of luck! I paid $30 for THIS?!?!? !